Do I need horse experience to participate in these workshops? No! No horse experience is required. All activities with horses are done on the ground in a safe, supportive environment. No. All horse activities are on the ground. 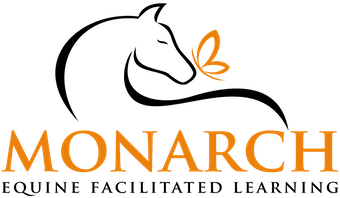 Where is Monarch EFL located? We are a 35-minute drive from downtown Des Moines, just west of Indianola, Iowa and 20 minutes from the Des Moines airport. Closed toe shoes are essential—boots are ideal. The weather can be unpredictable so we recommend bringing layers, hats, sunscreen and sunglasses. Yes! There is one room for rent at Monarch EFL—contact us for details. Hotels and bed and breakfasts are available in Indianola, Iowa just 10-15 minutes away or in Des Moines (a 35 minute drive to downtown). Is transportation available to and from the workshop site? No. Participants need to provide their own transportation to and from the workshop.